What is meant by green timber? Green timber does not refer to the colour of the timber, neither does it necessarily refer to the environmental credentials of the timber. Green timber means that the timber is relatively freshly cut, from timber in the round, and has a much higher moisture content by percentage than seasoned timber. Deciduous trees, such as Oak, are in leaf from spring until autumn and spend their time drawing up ground water through their roots to meet the needs of photosynthesis. They then pass the resulting sugars back down the trunk to feed fresh cell growth. This movement occurs through the long straw like cells of the tree termed “vessels” that run its entire length. Once the leaves are shed in autumn and this process ends, the trees are essentially dormant and the movement of water up and down the tree ceases. Evergreen trees such as Douglas Fir keep their leaves or needles in winter but their rate of photosynthesis will be greatly reduced. Water held within the vessels of the of the tree is termed “bound water” and can take many years to leave the timber dependent on the size of timber and the atmospheric conditions it is subject to. Ideally timber for heavy timber framing is cut from winter felled trees. This means that right from the start the level of bound water in the timber is being kept to a minimum resulting in a lower moisture content. Whilst the tree awaits conversion into dimensioned timber, it is said to be “timber in the round”. The intervening period between felling and conversion has historically been up to 18 months and the moisture content of the felled trees was seen to fall from anywhere up to 80% to roughly between 20 – 30% as the “free water” is lost from the tree. With the current fashion for timber framing and the resultant increased demand for supplies of green timber, timber at the time of conversion and framing is likely to have a greater moisture content. Ease of working. The timber will still be relatively soft. This makes cutting the frame joints much easier and the cutting edges of tools will need re-sharpening less often. Cost. Dry or “seasoned” timber of the sections required for construction would need to be stored for a considerable time after felling to reach a moisture content that could be loosely termed as dry (any timber greater than 100 mm square cannot be termed dry; see BS 5756). The physical act of storage and the commercial worth of the land it is stored on increases the value of dry timber by several times its green value. What should one expect from a green timber frame? Once the frame has been cut and erected, the timber will continue to loose the bound water from its vessels for some time, until it reaches an equilibrium with the atmospheric humidity within the building, typically around 12%. Rate of drying. Crucially it is not the loss of moisture that is important but the speed at which equilibrium is reached. 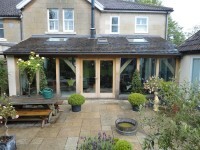 The slower the rate of drying, the lesser the visible effects on the timber and the structural integrity of your frame. Shrinkage. Green timber can shrink by around 8% of its original volume in cross section over time. This shrinkage will not manifest itself in an equal or ordered way and is dependent on the section of the round that the squared timber is cut from. However shrinkage through the length of the timber is negligible at around 0.1%. Checking. As the squared timber dries out it is still reacting to the fact that it was originally circular in section and built up of many concentric circles. Once the timber has been cut square, the strength of the circle is broken and the timber is pulled in different directions by the effect of drying. The bond between layers of cells comes under stress and where there is weakness, pulls apart. This can be seen on the face of the timber as cracks or “checks”. These checks are expected and very rarely lead to any weakness in the frame. The drying effects on the timber are allowed for in the formulae your engineer will have used to calculate the size of timbers required. Bending and movement. Timber is a natural product and grows in a way that is not entirely predictable. The trees your timber have been cut from will not necessarily have been dead straight. There will be curved grain and allowable knots in your timber. These factors will have been taken into consideration during the framing process but will still effect the way the timber moves as it dries out. Timber selection for areas to be glazed. The timbers selected by your framer for the areas to be glazed should be graded to be as straight grained and as knot free as possible to reduce the amount of movement seen in the timber as it dries out. 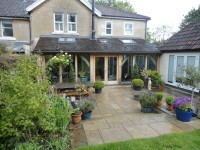 This is a higher grade than framing timber and is known semi officially as “glazing quality”. All the effects of drying we have spoken about may take many years to manifest themselves and as we have said before, the slower the drying process, the better off your frame will be. We therefore recommend that the use of any heating in a green heavy timber building is kept to a minimum for as long as possible, preferably a couple of years. Whilst all these factors are outside of our control, Black Pig understands these effects and we are so confident in our ability to work around them, that we give a 25 year guarantee for our labour and materials and the the same for all IGU’s supplied by us (this excludes joinery units which have different conditions). Please see the guarantee section for further details.